When most of us think of getting fit, the first thing we think of is that we will be losing weight and burning body fat. But in fact, unless you are obese, these may be the last things you need to think about. Sure, losing that last 5 kilos is always a bonus and generally the hardest weight to shift, and as every woman (and man) knows we always feel a little better when we are less rounded or ‘bloated’. But do we think about what else we gain when we embark on a new training regime or lift those weights to fatigue in class? We should! Muscular strength and endurance, along with cardiovascular and aerobic improvement, body composition (percentage of body fat to muscle) and metabolic changes should be high on your list of goals to achieve through training. Strength training is essential to achieve the above. This article is about the importance of being involved in Resistance/Strength Training, especially for women, and not essentially about weight loss. Many women are literally afraid to lift weights, but the National Strength and Conditioning Association provides these stand points on Training for Women, and if followed, will help you stay healthy, strong and slim for your lifetime. Of course most of these points relate to men too, so you blokes out there – read on! Proper strength and conditioning exercise programs may increase athletic performance, improve physiological function (day to day activities) and reduce the risk of injury as we age and are beneficial to both males and females. Females can hypertrophy (increase muscle size) through resistance training, relatively the same as men, but not absolutely the same. Females have the same muscle fibre types as men, but they are smaller in their cross-sectional area, hence their smaller size gains. Females will not ‘bulk up’ like a male due to their limited levels of testosterone. It is simply not possible to look like a female version of Arnold Schwarzenegger by participation in a weight training program. Unless of course you specifically want that result, which is a whole other topic. Resistance Training that utilises multi-joint (eg legs, back and chest) and structural exercises (eg a squat and then shoulder press) is recommended to induce sufficient stresses on the skeletal system and to enhance calcium storage in the bone to ward off osteoarthritis and increase or maintain bone density. Bone mineral density begins to decrease between 30-40 years of age. Females lose approx. 8% and males 3% of their skeletal mass every decade and are more susceptible to bone density loss the 3-4 years prior to menopause. As we are never really sure when menopause will hit, it pays to start early and keep going! People who participate in activities that are more non-weight bearing, such as swimming, tend not to have as great a bone density as those who do more weight-bearing exercise. Programs that target the major muscles and joints of the body have a potentially greater impact on maintaining and restoring bone density, than single discipline exercise activities such as walking. People who have participated in exercise activities over their lifespan, particularly in the first 30 years of life, are in the best position for making the greatest gains in bone density, than those who discover exercise later in life. However, whilst gains can be made, there is every chance that bone density will return back to pre-exercise levels if the program ceases. More reason to keep moving! Resistance Training has demonstrated favourable changes in body composition with minimal changes in body weight. In other words, body fat loss and an increase in lean muscle mass. The more lean muscle you have, the better your metabolism. The more lean muscle mass you build through resistance training, the higher the ‘resting energy expenditure’ (REE). Most of the calories you burn during the day is not when you exercise, but when you rest. Your heart, lungs, digestive system and most importantly, your brain, work 24/7 and require a constant energy supply. As a result, about 70% of your metabolic demands come from REE. If you are moderately active, you burn an additional 20% of calories during ‘activity energy expenditure’ (AEE). The last 10% comes from simple digestion and breakdown of food and metabolism otherwise known as ‘diet induced thermogenesis’ (DIT). Obviously if you want to lose weight and keep it off and start burning more calories while you rest, you have to exercise. Exercise burns extra calories and helps shift unhealthy stubborn fat, and helps you to preserve and build lean muscles that will keep your metabolism high. Muscle tissue is the powerhouse of resting metabolic rate. Eating and Energy – if you have enough energy through all food groups, and complex carbohydrates, you can exercise at a higher intensity for longer. Which in turn will burn up more calories just through exercise (past that 20%) and you will boost your metabolism, improve your digestion, and have positive changes on your hormones. So whilst dieting can make you lose weight in the short term, the best way to maintain weight is through sensible eating and exercising, and you will ward off the inevitable loss of lean muscle tissue that is related to aging. If you cease to exercise you will see drastic drop in your endurance, strength, power and ultimately additional muscle mass. All of this reflects on your REE – the calories you burn at rest and results in a slower metabolism. Strength training is essential for injury prevention and increased performance. Through strength work you can tend to the weaker supportive muscles that can get neglected such as the gluteus medius, rotator cuff, hip stabilisers, abdominal and lower back region. Strength doesn’t necessarily have to equate to muscle mass and huge bulging biceps – it can simply refer to your increased ability to recruit extra muscle fibres in times of need, such as when you are running up a steep hill. Strength also ensures your joints, ligaments, soft tissue and bones are strong and sturdy enough to withstand repetitive pounding, in running and most sports. Power and Speed also comes from Strength Training. Plyometrics and explosive exercises such as box jumps, squat jumps, lunge jumps etc result in a greater muscle fibre recruitment, which in turn gives you more muscle fibres available for the explosive exercise you are performing. Eg a sprint finish up a hill! In a nut shell, don’t always rely on cardio exercises such as running to improve your body and performance. If want to change your body, you will have to change your lifestyle and approach to training. Move more and get your heart rate up, and eat better quality food, but make sure you include resistance training in your fitness regime at least twice a week. You should then reduce your body fat, increase your lean muscle mass, lose centimetres, increase your metabolism, prevent injury and improve your performance results. Half a bunch of fresh kale leaves, stems removed and chopped coarsely. Place quinoa in stock, add Moroccan season and cook according to instructions until light and fluffy. Set aside with lid on saucepan so that any remaining water is absorbed. Place oil, lemon and zest, and rest of ingredients in a bowl and toss to combine. Add cooked quinoa, toss and serve warm or cold. Great as a meal or a side dish. Add tuna for extra protein as a complete meal. SOOOOOO NUTRITIOUS AND YUMMY – ONE OF MY BEST YET!! What a wonderful way to spend Mother’s Day! 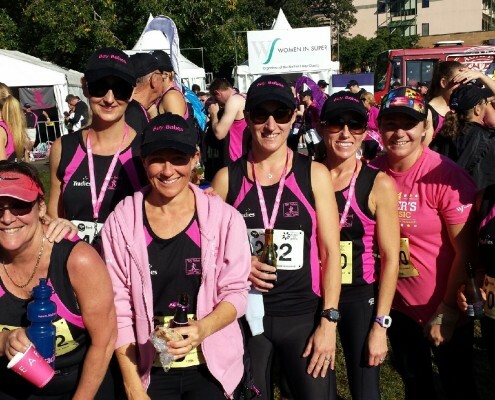 Being a part of the amazing Bay Babes is a truly special experience, as all the Gymea Bay mums and their families get together to celebrate the day, their health and to raise money for a wonderful cause, Breast Cancer Research. And once again, the Gymea Bay Babes took out the award for the Biggest Community Group! Well done to the organiser Chris Callinan and her committee of volunteers. Amongst us there were survivors, carers and of course those battling the illness right now, so it speaks volumes about how important this event is. The event consisted of 4km & 8km Walks, and 4km & 8km Runs. There were some that chose to walk with their families and others that took the event more seriously, and for those that ran the race in earnest, there were some fabulous results and massive improvements in times over last year. 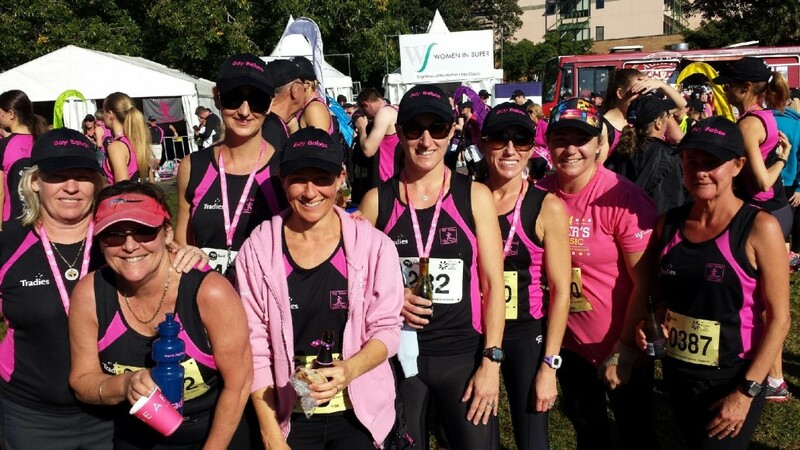 Special mention goes to Natalie O’Brien and Linda Knowles of Gymea Bay that had great results in the 8km Run, with Natalie coming 2nd in her age (30-39) and 8th overall, and Linda coming 10th in her age (50-59) and a huge PB. She wasn’t the only one with a PB and there are too many to mention here, but I have to say as a trainer I am so proud of all of those that ran, as they all had a go and did their absolute best on the day. And that is all that matters! I hope to see you all again next year and would love to see even more new faces at the event! Weight loss is hard, yes? There wouldn’t be too many people out there that would disagree with me. Nearly all of us watch our weight, if not all of the time, at least at somestage in our life – and we should. It is part of living an healthy active life, and being mindful of our consumption (as overconsumption is so easy to do) and to be aware of what we eat, when we eat, and why we are eating. I know I have mentioned to you all that watching your weight is a simple equation on calories in V’s Calories out, but I have also mentioned to you that everyone is different and everyone metabolises foods differently, due to your lean muscle mass composition, genetics, type of exercise you do, your hormones, stress levels just to name a few. Also, you all have different fitness levels that affect your ability to burn calories. You also know that I am a big believer of high intensity interval training, and that this is more beneficial than say, walking, for fat loss and increased fitness. So, that said, here is an article written by the very clever Andy DuBois that may better explain why some of you are finding it easier than others to lose the weight. It also explains why I am so focused on you eating not a low calorie diet, but a HEALTHY diet. And why I also bang on about the obvious importance of exercising regularly, and at the right intensity for your desired outcome. I have highlighted a few good points that I want to focus on and hopefully this will explain more about the differences in food (and why I hate white stuff!). It also mentions that there are inaccuracies with tools of measurement such as Heart Monitors and calories counters etc. While this is true, without the use of these tools many of us would have absolutely no idea of the calories in foods and how many calories you burn during exercise, so these tools are still invaluable even if they cannot be measured exactly. They allow you to take an element of control over your diet, but more importantly, your exercise and eating behaviour. Fat loss is easy, all you have to do is eat fewer calories than you burn, or so many people would have you believe. If you aren’t losing weight then you are either eating too much or not exercising enough. Unfortunately the human body is a little bit more complicated than that and the calories in vs calories out model of fat loss has some serious flaws. It’s all about balance yeah? 1. Food isn’t just calories. One assumption calories in v’s calories out makes is that the all the food we eat is converted into calories. This assumes that whether you consume fat , protein or carbohydrate (macro-nutrients) it is all going to be used for energy and no other purpose. This is an incorrect assumption. Protein is used for muscle repair. It is also found in our hair , nails , skin and brain and it can be converted into a number of hormones essential for the body to function. Fat is used for insulation , it is used in cell membranes , it makes up part of the fatty sheath that surrounds nerve fibres, it helps with the absorption of some vitamins and is a key ingredient in hormones and other chemical substances that are vital for the body to function. Carbohydrates are almost solely used for energy. So depending on what you eat a certain amount of the macronutrients will be used for maintaining the cells in our body. A meal high in protein and fat will have a percentage of its potential calories used as building blocks for the body whereas a meal high in carbohydrates will be used solely for energy. 2. The numbers don’t add up. According to the calories in v’s out argument if I ate 100 fewer calories per day for a whole year I would lose 36500 calories or approx 4 kilos of fat. That sounds great you may think. What if I then kept this up for 10 years. I would then have lost a total of 40 kilos of fat. I currently weigh 67 kilos so I would then weigh 37 kilos! Now 100 calories is approx 1 slice of bread . So I wouldn’t exactly be starving myself. The good stuff There have been a number of studies that have shown that people eating the same amount of excess calories put on vastly different amounts of weight. If the calories in v’s calories out theory is correct then the amount of weight gain should be very predictable, instead it ranges enormously. Studies have also shown that it is possible to gain weight when eating fewer calories than your body supposedly needs to maintain weight. 3. It takes energy to store energy. Energy is required to convert food into a form of energy that can be stored by the body. The amount of energy required depends on whether it is carbohydrate, protein and fat and which scientific paper you read! The macro nutrient composition of your meal will affect how many calories are burned in converting food into a storable energy source. 4. Different macro nutrients affect our bodies differently. Hormones such as insulin and glucagon affect our fat storage or fat usage systems. Other hormones like leptin and ghrelin affect our feeling of hunger and satiety and all of these hormones are influenced by what we eat. The primary influence is not the amount of calories that we eat but the type of food we eat. If the calories in vs calories model out is correct then it shouldn’t matter if we obtain all of our calories from pure sugar or from lentils. If we eat fewer calories, then we should lose fat. But sugar has a vastly different hormonal effect on the body than lentils. If the low-calorie theory is correct, then it is important to figure out how many calories we need to eat and how many we are burning per day. After all, 100 calories extra and you will put on 4 kilograms in a year! It is almost impossible to measure either the amount of calories you eat or the amount of calories you burn to anywhere near that degree of accuracy. Any watch or machine that tells you how many calories you burn is making some pretty big assumptions. The amount of fat and muscle you have will affect your calorie usage, your genetics will also affect it, as will the amount of sleep you had, the temperature, the time of day, your stress levels and numerous other factors. There are numerous calorie counters that will tell you how many calories are in a certain foods but the level of accuracy of these is very questionable. How many calories in an apple for example , a quick search on the net shows anything from 70-120 for the same size and type of apple. If you are measuring everything you eat, and using a state of the art watch to measure your calories burned you are still only going to have an estimate that is maybe several hundred calories out. Clearly this isn’t a good way to go about losing fat. Why do some people lose weight when they count calories? The primary reason some people are successful is that when people calorie count they choose healthier foods as they are often lower in calories. It isn’t the fewer calories that promotes the weight loss it’s the healthier food choices. So if counting calories doesn’t work what should you do? Whilst there is a raging argument going on between low carb, high carb, Atkins, Paleo, Dukan, South Beach or any of hundreds of other diets, I prefer to keep it simple. Eat a diet high in vegetables, a moderate amount of fruit, legumes, protein and good sources of fat, low in grains and cut out the processed stuff (it’s not really food). Love it, love it, love it! I hope you got something out of this. So, next time you head for that burger, fries, extra couple of slices of white bread or sweet biscuit, think of the response your body is going to have after digesting it. Combine cumin, garlic, oil and orange rind in a class or ceramic bowl. Add chicken and season to taste with salt & pepper. Thread 4 pieces or chicken onto each skewer. Combine orange segments, lentils, parsley, chives, onion, celery and cucumber in a bowl. Season to taste with salt & pepper. Divide among serving plates. Serve hot with cumin spiced yoghurt.